How to make tender, fall-of-the-bone oven baked ribs that are slathered with our homemade bacon bourbon barbecue sauce. 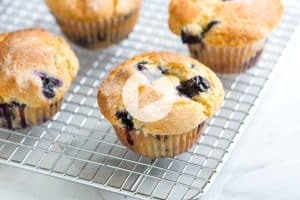 You’ll want to make these over and over again. 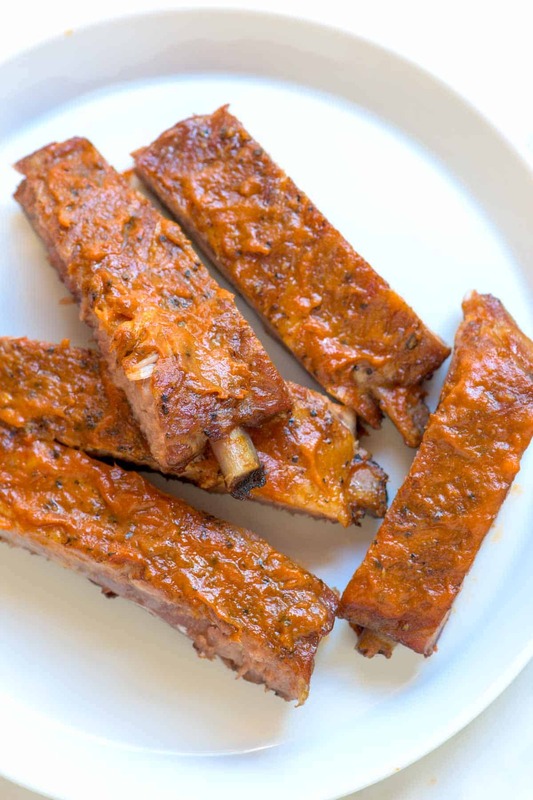 Jump to the Bacon Bourbon Oven Baked Ribs Recipe or read on to see our tips for making them. Did you know that it’s easy to make made incredibly tender, fall-off-the bone oven baked ribs? It is and you can definitely make them in your own kitchen. Let us show you how to make really, really good ribs that are so good, you’ll want to make them over and over again! Remember that Bacon Bourbon Barbecue Sauce recipe we shared last week — we went ahead and slathered ridiculously tender, oven-baked ribs with it. It was awesome. 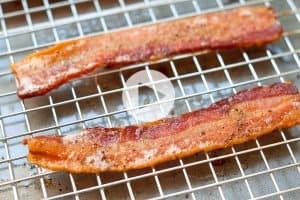 YOU MAY ALSO LIKE: Click the photo to get the Barbecue Sauce recipe now, it’s insanely good — I mean, come on, bacon AND bourbon? It’s even easy to make — no complicated ingredients and you can make it in under an hour. When making ribs in the oven, the most important ingredient is time. Cooking low and slow — or at a very low temperature for a long time — is the secret to ribs baked in the oven. We heat our oven to 275 degrees F and cook the ribs around 2 hours — sometimes a little longer if the ribs are larger or more meaty. While the oven heats up, we prepare the ribs — we treat spare ribs and baby back ribs the same way. 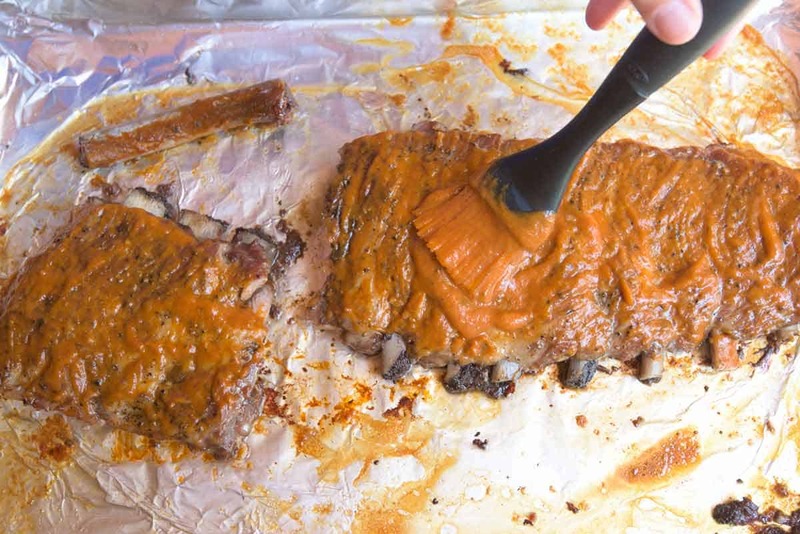 Remove the membrane on the back of the ribs — it can be a little tough when cooked. 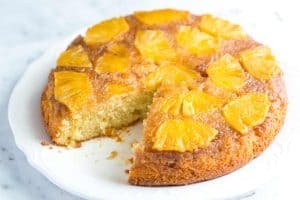 See our recipe below for photos and the how-to on that one, it’s really simple. Once the membrane is dealt with, we season our ribs with anything from simple salt and pepper to a flavor-packed spice rub. This is where you get to play — use what you love! After seasoning the ribs, cover with some foil and bake. Fast-forward 2 to 3 hours and you’ll have tender, fall-off-the-bone ribs ready for sauce. This is where we broke out our bacon bourbon laced homemade sauce, but if you’ve got a favorite store-bought or homemade sauce, use that. And there they are: tender, juicy ribs. Try this one soon, guys. We’re pretty sure you’ll be hooked. We are. 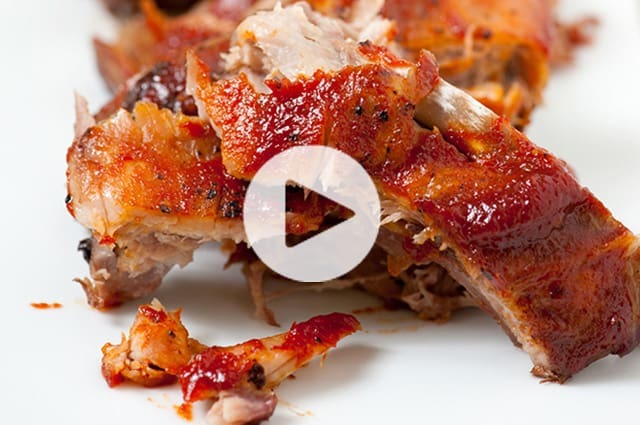 WATCH: We’ve shared oven baked ribs with you before and have even made a video showing you how we do it. 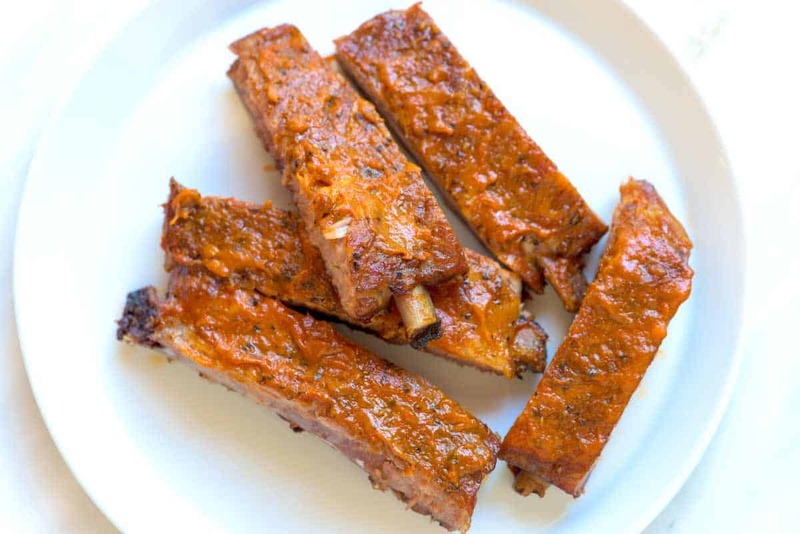 This recipe uses a simple spicy sauce, but the method for baking the ribs is the same. Click here to watch it now. Making you own tender ribs at home is seriously easy to do and really only takes time and your favorite spice rub and/barbecue sauce. 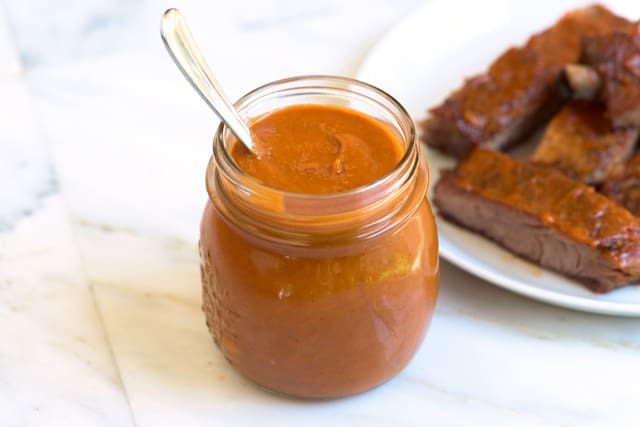 We’ve been using our homemade Bacon Bourbon Barbecue sauce lately — it’s meaty and so savory, which is perfect for ribs. If you aren’t in the mood to make your own sauce, use your favorite store-bought brand (although, I must say, homemade is pretty darn good). Heat oven to 275 degrees F and line a rimmed baking sheet with foil. Place the ribs meat side down on the work surface then locate the thin membrane that covers the rack. Since this membrane can become tough when cooked, we prefer to remove it. To remove it, use a butter knife and gently slide it under the membrane. Wiggle it from side to side until you can get your fingers under it. Then simply pull the membrane away from the ribs and discard. You might find that you need to use the knife to loosen the membrane a few times since we almost never get it all in one go. Trim excess fat then generously season both sides of the ribs with salt, pepper and/or your favorite spice rub. Note: Seasoning the ribs can be done in advance — a nice idea when using a spice rub — simply season the ribs then wrap in plastic wrap and refrigerate. 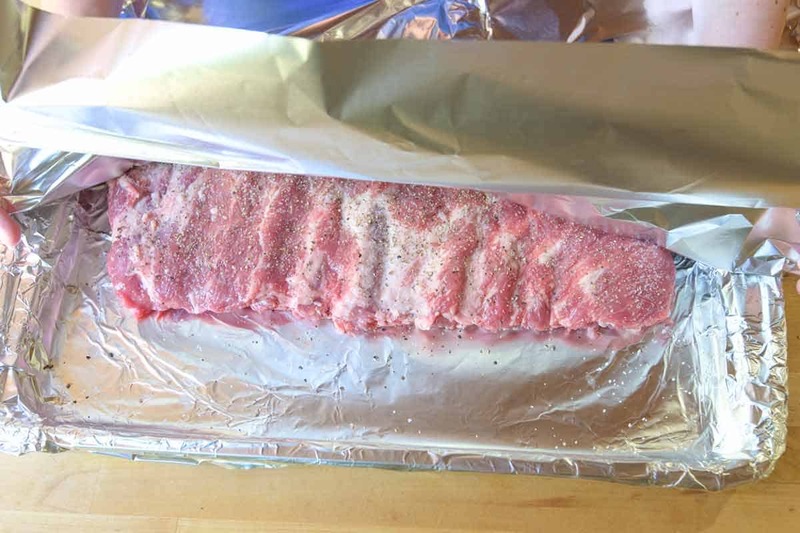 Place the ribs, meat side up, onto the baking sheet and cover with aluminum foil. Bake the ribs until fork tender, 2 1/2 to 3 hours. Turn broiler to high then brush the ribs with barbecue sauce on both sides until well coated. Be careful when you turn them — the meat will be extremely tender. Broil the ribs until the barbecue sauce begins to bubble and caramelize, 3 to 5 minutes. Let ribs rest 5 to 10 minutes then cut into either single ribs or into sets of 3 or 6 ribs. Serve with leftover barbecue sauce on the side. If you have one, insert a baking rack into the baking sheet then place the ribs on top. This will allow heat to circulate around the ribs more evenly. 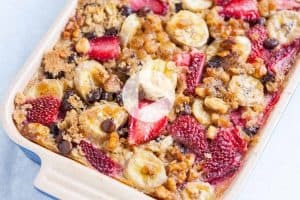 If you do not have a rimmed baking sheet, use the largest baking dish you have — we have used our 13×9-inch pyrex dish before. You may find that you need to cut the ribs in half to make them fit, but it still should produce excellent results.